With collaboration and support from the U.S. Conference of Mayors, Route Fifty set out to identify what local government officials rank as the highest priorities when it comes to the future success of their communities. To that end, Route Fifty’s research arm, Government Business Council (GBC), conducted an in-depth study on the priorities of city- and county-level government employees, including a large number of senior staff. Concerns about the job market, economic growth and financial stability seem to be a priority for most leaders. Earlier this year, Route Fifty found that only 35 percent of state and local government employees believed that their partners at other levels of government provided predictable financial support for their mission. National League of Cities’ City Fiscal Conditions Report from late last year also showed “the start of fiscal contraction in the municipal sector following several years of post-recession growth.” That may be reflected in the high prioritization of economic drivers and financial stability. Career public officials are particularly concerned, as the signs of rot in our infrastructure are less visible to the average citizen. 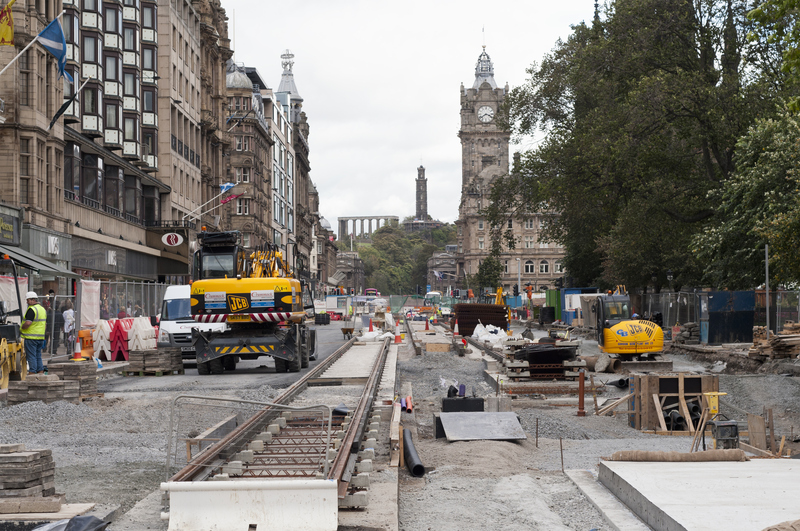 However, the prioritization of infrastructure should be a warning to all levels of government. In a time of increasing inequity, our survey results show less of a focus on prioritizing citizen-focused services among local government officials. This comes at a time when Congress, the Trump administration and some states have looked at new requirements—and rollbacks—for key programs that help the neediest people. The prioritization gap between the financial welfare of the government, economic development and support for policies that lift up those who may have been left behind by economic success should raise some red flags for those who believe such programs are vital to the nation’s future success. Education of officials on how these programs fuel economic vibrancy and sound fiscal conditions may be necessary for those that are concerned by these results. Taxation, Finance, and Budget was identified as the top priority for local government in 2018. Source: Route Fifty and Government Business Council Local Government Priorities Survey, 2018. The rank order displayed above reflects respondents’ prioritization of issues with an eye towards future success. Issues ranked higher should be seen as more closely linked to perceived future success and those ranked lower should be seen as less closely linked. Jurisdiction size accounts for some of the largest differences between the study’s demographic groups. While Affordable Housing was the lowest priority for those in jurisdictions with less than 25,000 residents, it was fifth-highest for those in cities/counties with more than 150,000 residents. Similarly, whereas respondents in jurisdictions with more than 150,000 residents ranked Infrastructure/Transportation as their top priority, it was only third-most and fourth-most important for those in mid-sized cities (25,000 to 150,000 residents) and smaller cities (less than 25,000 residents), respectively. Respondents in the nation’s largest states – that is, the ten states with the largest populations in the United States – rank Infrastructure/Transportation more highly than their counterparts in smaller states. They are also much more likely to prioritize Environment and Resiliency: Individuals in the ten most populous states rank this issue even above Public Health/Health Care, whereas those in smaller states rank it below all other issues in the study. Despite some similarities, the priorities of individuals in career government positions differ considerably from those of elected/appointed officials. 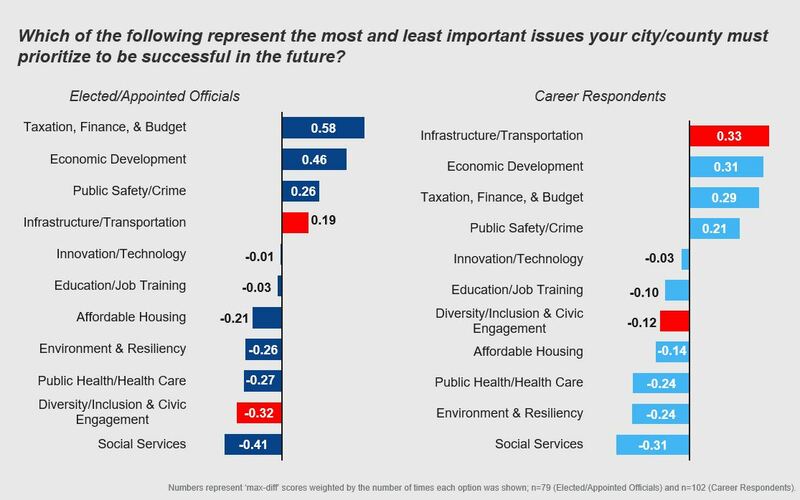 While Infrastructure/Transportation is just the fourth-most prioritized issue for officials, those in career positions rate it as their top priority. Similarly, while Diversity/Inclusion and Civic Engagement is given considerable weight by career respondents, those in elected/appointed official capacities see it as the second-least important issue after Social Services. Along with Economic Development and Infrastructure/Transportation, individuals in executive/legislative office functions and those in other primary mission areas prioritize Taxation, Finance, and Budget. Respondents in non-executive/legislative office mission areas prioritize Public Health/Health Care significantly higher than those in executive/legislative office roles. Officials in larger cities are more likely to prioritize affordable housing; those in mid-sized cities place focus on economic development. 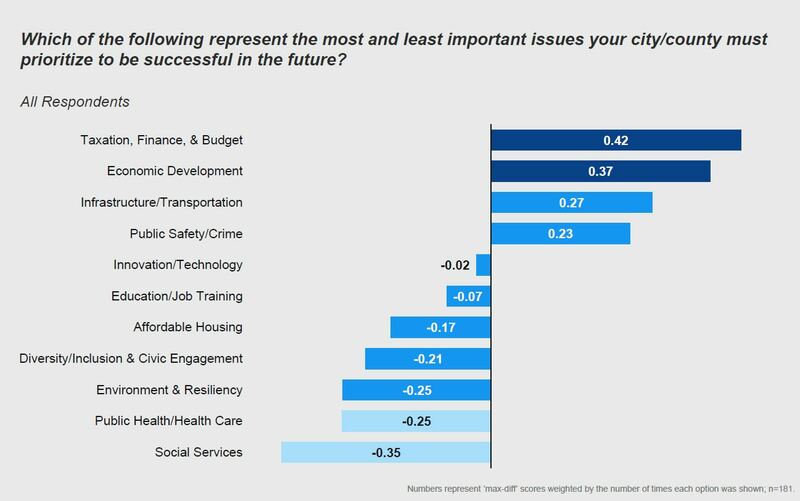 While taxation, finance, and budget is among the two most highly ranked priorities for respondents in small- and medium-sized cities, those in larger cities tend to see infrastructure/transportation as more of a priority; affordable housing is also a greater concern in larger cities. Conversely, respondents in small cities (i.e., those with fewer than 25,000 residents) do not prioritize this issue. Of the three jurisdiction sized-based groups, respondents from smaller cities prioritized taxation, finance, and budget most highly — they were also the only group not to include infrastructure/transportation in their top three priorities. Similarly, while public health/health care and affordable housing were middle-tier and top priorities for those in medium- and large-sized cities, respondents from smaller jurisdictions rated both issues among their lowest priorities. For respondents that work in mid-sized cities (i.e., those with 25,000 to 150,000 residents), economic development and taxation, finance, and budget are the biggest points of focus. They also see infrastructure/transportation as an important factor in the future success of their jurisdictions, but rate it less highly than respondents in larger cities. 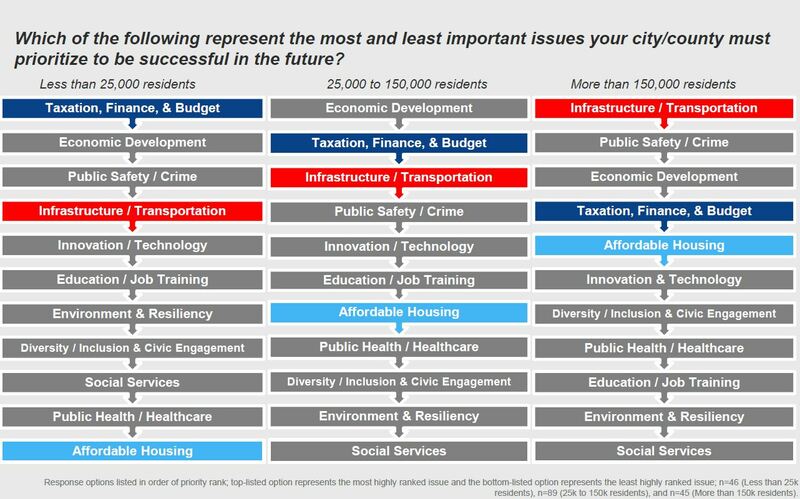 Infrastructure/transportation and public safety/crime are the largest priorities for respondents from larger cities. According to those in jurisdictions with more than 150,000 residents, economic development is another front-of-mind concern. Conversely, social services, education/job training, and environment and resiliency are relatively low priorities. Individuals in larger metropolitan areas are also least likely to prioritize education/job training. Respondents from large states are more likely to prioritize infrastructure/transportation, environment and resiliency. Individuals in the ten most populous states in the US differ from their counterparts in smaller states in a few important ways. While respondents in these states largely discount diversity/inclusion and civic engagement as one of their lower priorities, those in smaller states rate it ahead of issues like affordable housing and public health/health care. 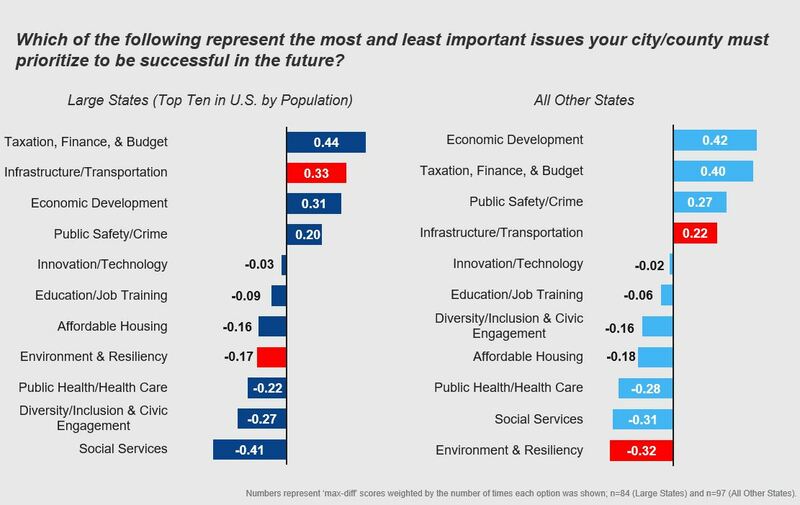 Similarly, while public safety/crime is in the top three priorities for individuals in smaller states, local government respondents in large states are more acutely concerned with infrastructure/transportation. Those in larger states also rate environment and resiliency much more highly than their small-state counterparts, who place this issue at the very bottom of their priority lists. Taxation, finance, and budget tops the list of concerns for respondents from large states. They are also likely to prioritize infrastructure/transportation and economic development. Economic development and public safety/crime appear towards the top of the priority list for local government in smaller states, in addition to taxation, finance, and budget. Conversely, these respondents place relatively little emphasis on environment and resiliency, social services, and public health/health care. Elected/appointed officials more likely to prioritize taxation, finance, and budget; economic development follows as the second-highest priority. Elected/appointed officials were significantly more likely to prioritize public safety/crime, mostly ranking this issue highly in lieu of infrastructure/transportation. Conversely, infrastructure/transportation was the top-ranked priority for respondents in career positions within local government. Still, these two groups have more similarities than differences: Both elected/appointed officials and career government staff rank economic development and taxation, finance, and budget among the top three priority issues for their jurisdictions. Additionally, they both rank social services and public health/health care towards the bottom of their issue lists. As with other demographic groups segmented in this study, elected/appointed officials in local government rated taxation, finance, and budget as their top priority. Economic development and public safety/crime were also included in the top three priorities for elected/appointed officials. Additionally, elected/appointed officials ranked public health/health care – an issue receiving at least moderate priority for other demographic groups – lower than typical. 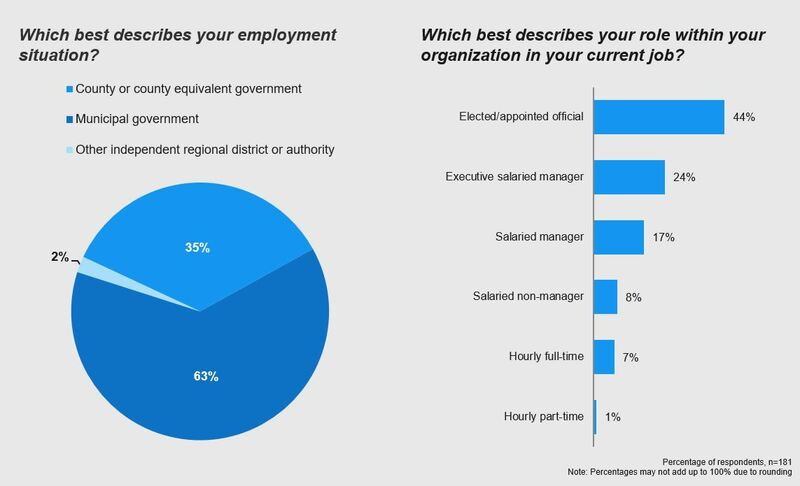 Infrastructure/transportation is the top priority for respondents in career staff positions in local government. While this is the most highly ranked issue, individuals in non-official positions also see economic development and taxation, finance, and budget as keys to their jurisdiction’s future success.Diversity/inclusion and civic engagement ranks more highly for this demographic group than for others. Respondents in executive/legislative office roles more likely to prioritize taxation, finance, and budget; also see economic development as key. While the top three priorities (economic development; taxation, finance, and budget; and infrastructure/transportation) were ranked similarly for both groups, the orders differed. 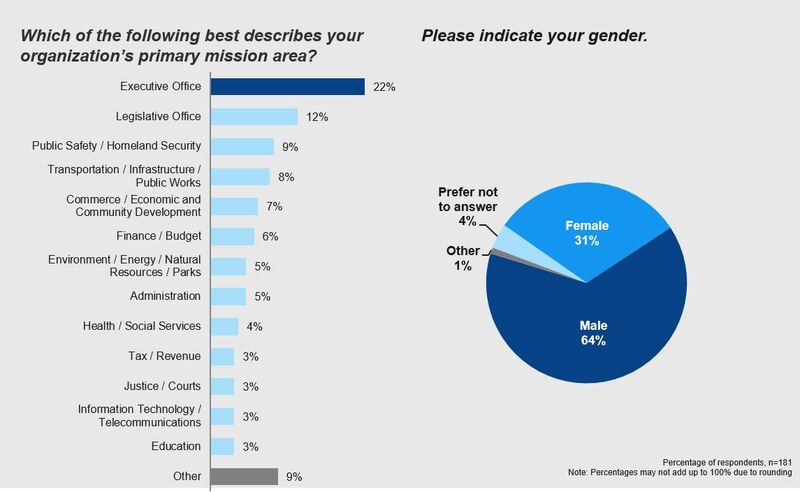 Whereas those in executive/legislative office missions rank economic development as their top priority, it is only the third-most important priority for respondents in other mission areas. Similarly, there were differences in the issues ranked least important: While individuals in non-executive/legislative missions rated environment and resiliency as their second-least important option, this was staunchly in the middle tier of concern for their counterparts executive/legislative missions. Public health/health care was also a higher priority for those in non-executive/legislative office mission areas. 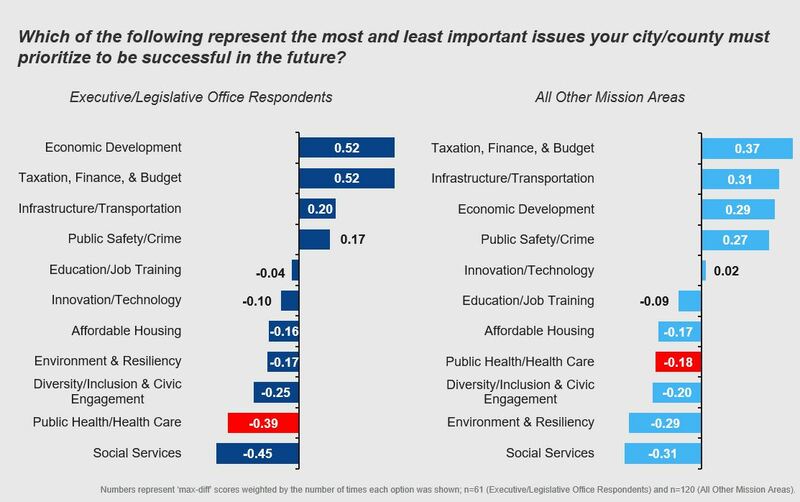 Economic development and taxation, finance, and budget were tied for the most highly prioritized issue for local government officials in executive/legislative mission areas. Concern about infrastructure/transportation was also ranked highly by these respondents. Conversely, social services, public health/health care, and diversity/inclusion and civic engagement are the lowest priorities. To learn more about the findings from this year's study of local government priorities, please click the link below to go to the download page. The full version contains detailed findings for each of the demographic groups mentioned above as well as more information on the MaxDiff methodology used in the study. Click here to download the full report, Critical Priorities for local Government: A Candid Survey of Local Government Officials and Agency Leaders. Most respondents work in municipal or county/county equivalent government; a large plurality are elected/appointed officials. Though more than one-third of those surveyed are dedicated to executive/legislative offices, a broad range of mission areas are represented. Nearly two-thirds of respondents are male. A large majority of individuals in the study are manager, with at least one direct report. 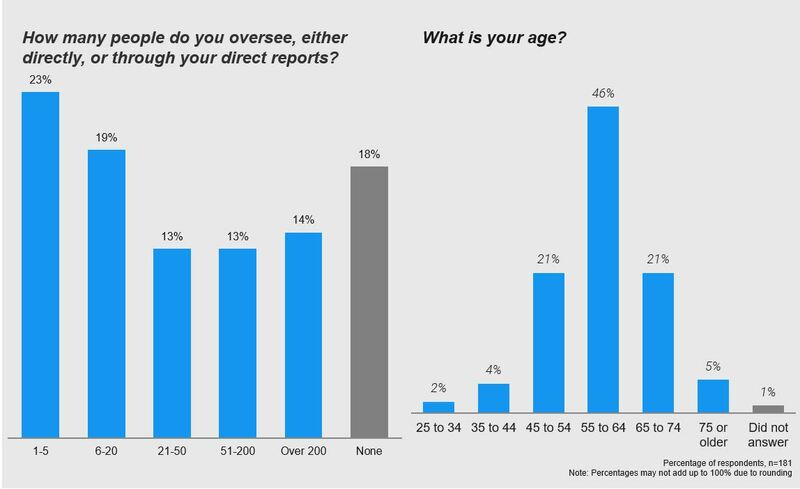 A broad range of age groups is represented in the report. Survey respondents reside in a variety of jurisdiction types and regions. Route Fifty and GBC asked the U.S. Conference of Mayors for input and advice in the lead-up to the survey; their advice was critical in shaping the key priorities. Our survey was released between April and May 2018 to a random sample of local government employees in city and county agencies. A total of 181 respondents completed the survey through a statistical instrument known as ‘MaxDiff’ or ‘best-worst’ scaling. Using the MaxDiff approach, GBC was able to achieve a robustly determined rank for each of the local government issues that was measured. In alphabetical order, the issues that GBC measured are Affordable Housing, Diversity/Inclusion and Civic Engagement, Economic Development, Education/Job Training, Environment and Resiliency, Infrastructure/Transportation, Innovation/Technology, Public Health/Health Care, Public Safety/Crime, Social Services, and Taxation, Finance, and Budget. We’re particularly interested in stories about technology and innovation at the state and local level. But we cover a variety of topics under the larger state, county and municipal government umbrella beyond technology and innovation, including issues like management, budgeting, best practices, smart ideas, open data, open government and public services. Route Fifty and Government Business Council are part of Atlantic Media’s Government Executive Media Group, which also publishes Government Executive magazine, GovExec, Nextgov and Defense One. 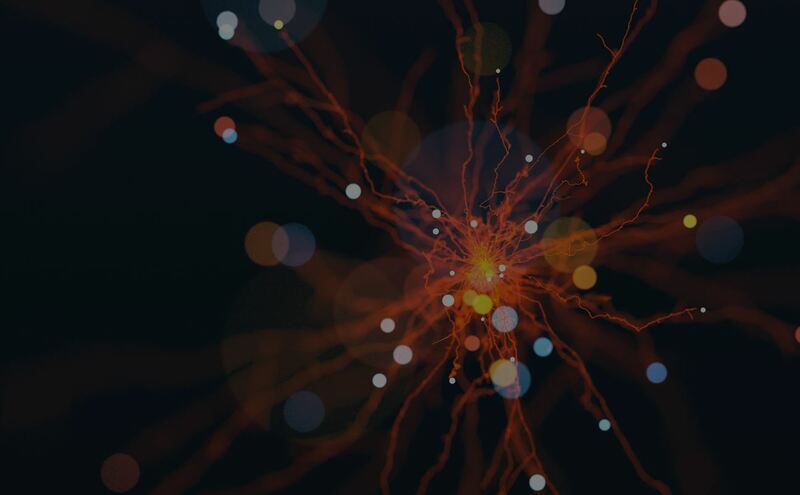 Amazon Web Services (AWS) Worldwide Public Sector helps government, education, and nonprofit customers deploy cloud services to reduce costs, drive efficiencies, and increase innovation. 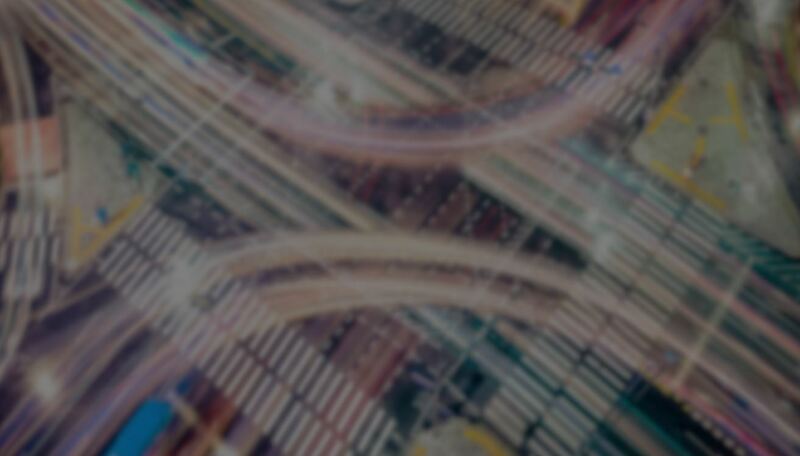 With AWS, you only pay for what you use, with no up-front physical infrastructure expenses or long-term commitments. 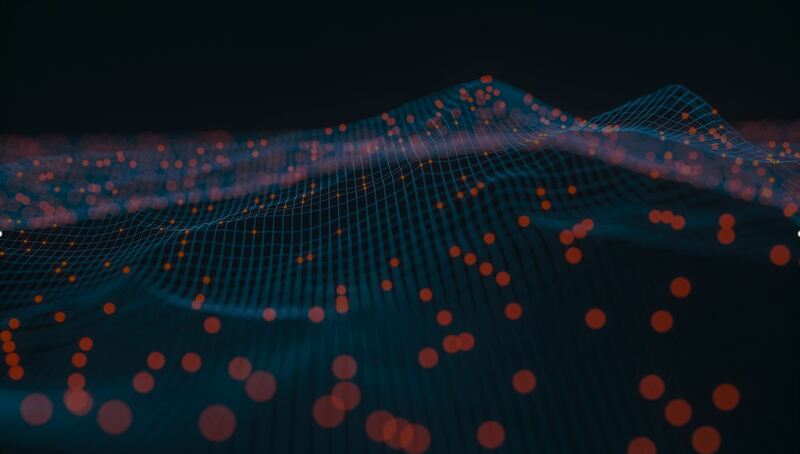 Public Sector organizations of all sizes use AWS to build applications, host websites, harness big data, store information, conduct research, improve online access for citizens, and more. 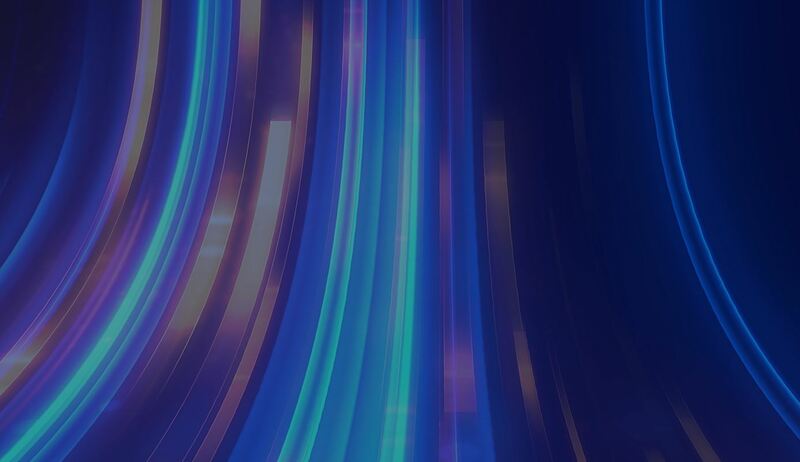 AWS has dedicated teams focused on helping our customers pave the way for innovation.